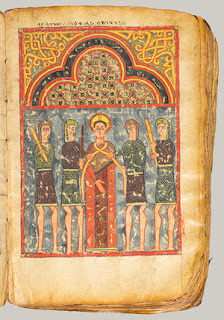 This illuminated manuscript of the Four Gospels was created in the late fourteenth to early fifteenth century at an Ethiopian monastic center. Its full-page paintings on vellum depict New Testament scenes from the life of Christ and portraits of the evangelists. The text is in Ge'ez, the classical Ethiopian language. Typical of Ethiopian painting, the imagery is two-dimensional and linear. Heads are seen frontally; bodies are often in profile. The artist abbreviated the facial features and treated the human form as a columnar mass, articulated in bold black and red lines. The Four Gospels are the essence of Ethiopian Christianity. This manuscript was likely kissed, displayed during processions, and placed on the altar to mark important events on the church calendar, such as feasts or holy days. Recent research suggests that a member of Ethiopia's ruling elite may have commissioned this manuscript of Dabra Hayg Estifanos monastery for presentation to his or her favored church or monastery. Brief notations indicate that the church in question was dedicated to the Archangel Michael.